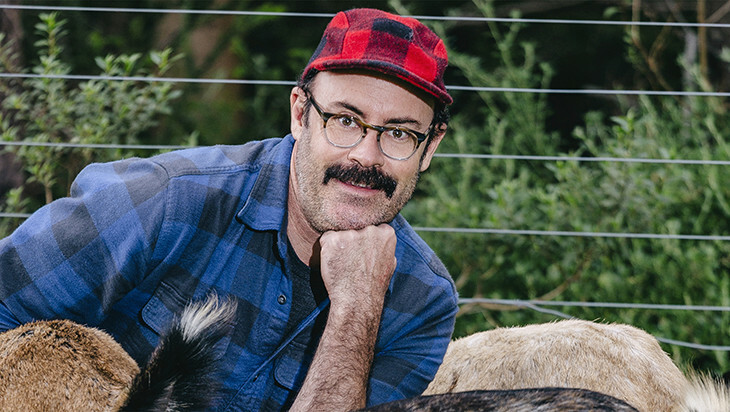 Sam Simmons’ comedy is like your favourite vineyard, most vintages the wine is good, some vintages the wine is exceptional and some it is a little bit different to what you normally expect. 2018’s Sam Simmons’ vintage – Radical Women of Latin American Art, 1960-1985 is a combination of the first and last variation, it is good and a little different. Simmons’ show this year was a lot more sedate than prior. Although sedate does not mean conventional and certainly it doesn’t mean dull, gone are the wild costumes, far fewer prop gags and a reduced reliance on physical humour. Although a set piece of slapstick physical comedy delivered the biggest laugh and gasp at the same time in tonight’s show. This show is largely indescribable in content, being loosely structured around a voiceover describing a series of impressions that are performed weaving together relatively straight observational comedy and stories with songs and moments of complete absurdity. The sketches often leave the audience unsure of the expected reaction. You’re watching a master at work, and the master has decided he’s not going to make it easy for you. Simmons’ has always played with tension; the audience isn’t meant to laugh at the whole show. Plenty of the material seems to be designed primarily for Sam’s own amusement and secondly to provoke a half laugh or half applause from the audience to fuel a tirade of abuse at the audience, both as a single general entity and individual attendees. The point is the interplay between tension and hilarity and that is where Sam thrives. If people are laughing all the time, then they don’t appreciate the laughs as much. When the laughs come in a tense atmosphere they are worth so much more. 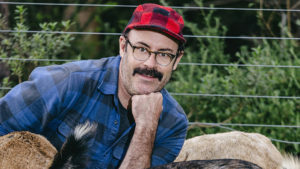 The audience reacted generally very well to this performance, with the appropriate mix of gasps, laughs and baffled looks that you may expect at a Sam Simmons performance. As I left the theatre one couple commented on him not being as good as prior years – I suspect because of the reduction in the prop and physical comedy. While it feels condescending to talk about a “maturing” performance for a 41-year-old comedian with years of experience, this was definitely a slight change in direction or perhaps more accurately a reversion to the core that makes Simmons’ so entertaining with less reliance on perpetually pushing the boundaries of physical comedy.